Summertime. And the livin' may not be easy, but with the pope's September visit to the U.S. followed soon thereafter by critical international climate negotiations in Paris, a bit of summer fiction and nonfiction offerings may make the fall a bit more well-informed. 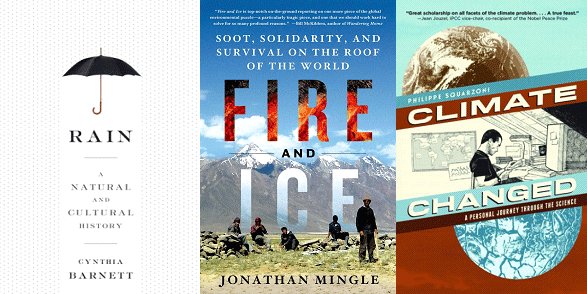 Here are nine selections for your summer-time climate change reading list. Descriptions are drawn from the publishers’ copy. Cynthia Barnett’s Rain begins four billion years ago with the torrents that filled the oceans, and builds to the storms of climate change. It weaves together science – the true shape of a raindrop, the mysteries of frog and fish rains – with the human story of our ambition to control rain, from ancient rain dances to the 2,203 miles of levees that attempt to straitjacket the Mississippi River …. As climate change upends rainfall patterns and unleashes increasingly severe storms and drought, Barnett shows rain to be a unifying force in a fractured world. Too much and not nearly enough, rain is a conversation we share, and this is a book for everyone who has ever experienced it. Jonathan Mingle describes the joys and struggles of daily life in the Zanskar Valley of the Himalayas, where villagers are buffeted by powerful environmental and economic forces, while also tracing black carbon’s dark fingerprints outward from Kumik and around the world. Mingle investigates its impacts on snow, ice, and water from Mt. Everest to California, and the silent health epidemic it fuels from New York to New Delhi. Combining cultural history, detailed reportage, climate and energy science, and dramatic storytelling, Fire and Ice is a profound examination of the global challenges of averting climate chaos and lifting billions out of energy poverty and water scarcity. What are the causes and consequences of climate change? When the scale is so big, can an individual make any difference? Documentary, diary, and masterwork graphic novel, this up-to-date look at our planet and how we live on it explains what global warming is all about. With the most complicated concepts made clear in a feat of investigative journalism by artist Philippe Squarzoni, Climate Changed weaves together scientific research, extensive interviews with experts, and a call for action. Weighing the potential of some solutions and the false promises of others, this groundbreaking work provides a realistic, balanced view of the magnitude of the crisis. In Future Arctic, journalist and explorer Edward Struzik offers a clear-eyed look at the rapidly shifting dynamics in the Arctic region, a harbinger of changes that will reverberate throughout our entire world …. A unique combination of extensive on-the-ground research, compelling storytelling, and policy analysis, Future Arctic offers a new look at the changes occurring in this remote, mysterious region and their far-reaching effects. While previous shifts from one geological epoch to another were caused by events beyond human control, our addition of carbon to the atmosphere over the past century has moved many scientists to declare the dawn of a new era: the Anthropocene – the Age of Man …. As an editor at Nature, Gaia Vince couldn’t help but wonder if the greatest cause of this dramatic planetary change – humans’ singular ability to innovate – might also hold the key to our survival. And so she left her professional life in London and set out to travel the world in search of ordinary people doing extraordinary things to adapt, and, in many cases, to thrive …. Part science journal, part travelogue, Adventures in the Anthropocene recounts Vince’s journey, and introduces an essential new perspective on the future of life on earth. The Age of Consequences is a book of ideas and action, but it is also a chronicle of personal experience. Readers follow White as he travels the country – from Kansas to Los Angeles, New York City, Italy, France, Yellowstone, and New England. Along the way he recounts stories of Amish farmers in Ohio, cattle ranchers in the Southwest, creek restorationists in New Mexico, local food entrepreneurs in Arizona, and carbon pioneers in Australia. Their stories inform and entertain, but they also reveal encouraging and hopeful answers to anguished questions about our collective future, including issues of sustainability, climate change mitigation, resilience, land health, collaborative conservation, ecological restoration, and regenerative agriculture. The American Southwest has been decimated by drought. Nevada and Arizona skirmish over dwindling shares of the Colorado River, while California watches, deciding if it should just take the whole river all for itself. Into the fray steps Las Vegas water knife Angel Velasquez. Detective, assassin, and spy, Angel “cuts” water for the Southern Nevada Water Authority and its boss, Catherine Case, ensuring that her lush, luxurious arcology developments can bloom in the desert and that anyone who challenges her is left in the gutted-suburban dust …. Paolo Bacigalupi, New York Times best-selling author of The Windup Girl and National Book Award finalist, delivers a near-future thriller that casts new light on how we live today – and what may be in store for us tomorrow. It’s January 1, 2015, and the U.K. is the first nation to introduce carbon dioxide rationing, in a drastic bid to combat climate change. As her family spirals out of control, Laura Brown chronicles the first year of rationing with scathing abandon. Will her mother become one with her inner wolf? Will her sister give up her weekends in Ibiza? Does her father love the pig more than her? Can her band the dirty angels make it big? And will Ravi Datta ever notice her? In these dark days, Laura deals with the issues that really matter: love, floods and pigs. The Carbon Diaries 2015 is one girl’s drastic bid to stay sane in a world unravelling at the seams. New York City, the near future: Mitchell Zukor works on the cutting edge of corporate irresponsibility, and business is booming. A brilliant mathematician, he spends his days calculating worst-case scenarios for FutureWorld, a consulting firm that indemnifies corporations against potential disasters. As Mitchell immerses himself in the calculus of catastrophe, he exchanges letters with Elsa Bruner – a college crush with her own apocalyptic secret – and becomes obsessed by a culture’s fears. When Mitchell’s darkest predictions come true and an actual worst-case scenario engulfs Manhattan, he realizes that he is uniquely prepared to profit. But what will it cost him? Odds Against Tomorrow, hailed by Rolling Stone as “the first great climate change novel,” is an all-too-plausible literary thriller, an unexpected love story, and a philosophically searching inquiry into the nature of fear. The future is not what it used to be.